After an epic, unforgettable Royal Rumble just two weeks ago, the Smackdown brand returned with its final pay-per-view event before Wrestlemania—the gimmicky but action-packed steel structure known as the Elimination Chamber. And that’s what this show delivered in spades: action, moves, high-risk spots, lather, rinse, repeat. Even if it offered the Wrestlemania card a bit more clarity (Orton vs. Wyatt looks to be the championship match), the show was three hours of mostly bubble gum for the eyes. It was neither the most incidental show from a storyline perspective, nor could it match the pure wrestling spectacle of the Rumble. But you can’t call the show a bore neither. The show began with a solid curtain raiser between Mickie James and Becky Lynch, a match showcasing James’ diverse moveset. The 37-year-old James put on an impressive, wide-ranging clinic of holds, submission techniques and offensive maneuvers, and proved why she should contend for the Smackdown women’s title. (Whether she gets lost in the shuffle remains to be seen.) For storyline purposes, Lynch—a likeable fan favorite—had to win here and continue her momentum. 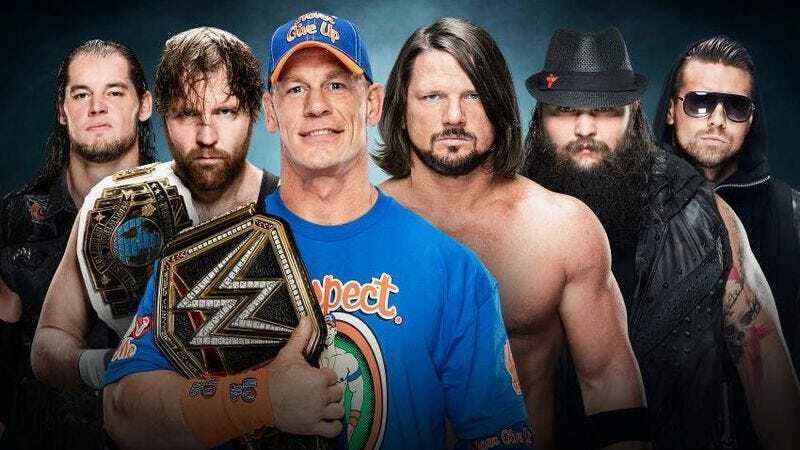 How this manifests at Wrestlemania remains to be seen, although the fantasy booker in me would put Lynch, James, Alexa Bliss, Naomi, and Natalya in a championship ladder match. The match that followed made no sense on paper. Why would Kalisto and Apollo Crews, two supposed good guys, be competing two-on-one against a Dolph Ziggler, a supposed bad guy who 80 percent of the crowd cheers for anyway? This makes little sense if you follow standard storytelling logic; the protagonist should be pitted against two antagonists, and ideally, the good guy facing insurmountable odds would prevail. At first, I thought this illogical setup was resolved even before the bell rung. As Kalisto made his entrance, Ziggler ambushed the luchador from behind, incapacitating him, making it a one-on-one match between Ziggler and Crews for much of the match. OK, so Kalisto was the goat, sort of made sense. Then three-quarters of the way through the bout, Kalisto came stumbling back and the handicap match was back in effect. The finish reinforced the irrationality of the booking: Crews beat Ziggler with his spinning sit-out powerbomb. The good guys look like geeks because it took two of them to beat one dude. Ziggler, despite his heel-enforcing post-match antics snapping Crews’ ankles, came away with a loss. Wins and losses still matter, and this match did no one any favors. The tag team turmoil bout that followed was effective because with 2-3 minutes for each matchup, it was all action and no filler. Heath Slater/Rhyno eliminated Breezango first, getting the comedy byplay out of the way. The Vaudevillians came next and were quickly dispatched. The Usos entered and dispatched Slater/Rhyno, setting up a showdown with American Alpha. After Chad Gable pinned Jey Uso, both members of American Alpha were jumped by The Usos and made into raw meat for the final team, The Ascension. Even left for dead, American Alpha pulled out a Grand Amplitude, because the thought of The Ascension as tag team champions is patently absurd. Nikki Bella and Natalya had themselves a nice little match—Bella, especially, has improved her game in recent months—but the double count-out finish made the match feel meaningless (also, Bella totally no-sold the sharpshooter). There was a nice surprise winner in the Smackdown women’s championship match as Naomi captured the title from Alexa Bliss in a fun match. The best part came after the match, in a moment when pro wrestling and reality collided—Naomi holding her new belt, the crowd chanting “you deserve it,” and the new champion breaking down in tears. Finally we arrived at the Elimination Chamber, and the problem with this storyline coming in was the relative lack of surprise. Let’s reverse engineer who could conceivably walk away the champion and face Randy Orton in the main event of Wrestlemania. Certainly not Baron Corbin; that would be a terrible match. Likely not Dean Ambrose, who will compete in his own Intercontinental championship, like a multi-person match. Most likely it wouldn’t be John Cena, since that matchup has been done ad nauseum and they just gave away that match on last week’s Smackdown. The Miz has been a fun act with his real-life wife Maryse, but the duo seems earmarked for a non-title story leading into Wrestlemania. That leaves A.J. Styles, who would have a hell of a match with Randy Orton, and Bray Wyatt, who makes better sense in storyline—brother against brother. John Cena and A.J. Styles began this match, picking up from their incredible Royal Rumble performance. Dean Ambrose came in next, and the three-way reprised their great triple threat match from No Mercy last October. Bray Wyatt entered next and up to this point, much of the action was one-on-one interactions as participants took turns “taking a nap” outside the ring. Baron Corbin came in and delivered a series of End of Days to everyone in sight. Corbin got schoolboyed by Ambrose as The Miz entered with hesitation, and Corbin laid waste to Ambrose in anger. The Miz took advantage of the situation and pins the incapacitated Ambrose. After The Miz did all the Daniel Bryan moves to draw heat, John Cena caught him in a crossbody attempt and turned it into an Attitude Adjustment for the pin and elimination. 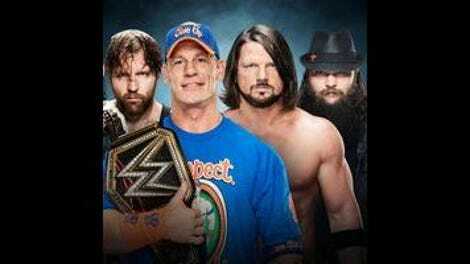 Cena, Styles and Wyatt were the final three. Cena executed an atrocious-looking ten-knuckle shuffle. Styles hits the Styles Clash on Cena, but Cena kicked out. Styles’ springboard forearm was countered into an Attitude Adjustment by Cena, which Styles kicked out. Then Cena climbed the chainlink fence and atop a pod (as someone in the crowd yelled, “don’t kill yourself, Cena!”) Cena leapt into a crossbody from the top of the pod and into both Styles and Wyatt. Wyatt then escaped another Attitude Adjustment by Cena and countered into his Sister Abigail, pinning Cena, which drew the biggest pop of the night. As predicted, Styles and Wyatt—the two most likely opponents for Randy Orton at Wrestlemania—were the final two competitors. Styles hits the 450 splash on Wyatt. Wyatt kicked out. Styles went for the springboard forearm. Wyatt caught him for a Sister Abigail outta nowhere! One-two-three and Bray Wyatt—son of I.R.S., brother of the Bo-liever—is your new WWE champion. An Orton-Wyatt staredown from a distance ended the show. Not what I would consider a marquee championship bout, but at least with new blood in the title picture, color me intrigued.